Our selections for Offensive, Defensive, and Breakout Players of the Year, and Rookie and Coach of the Year. Ultiworld’s 2018 Women’s College Awards are presented by the National Ultimate Training Camp and VC Ultimate, as part of their season-long support of our women’s coverage. All opinions are those of the authors. Thanks for supporting the brands that make Ultiworld possible! Ultiworld is pleased to announced our fifth annual College Awards. The criteria for each award can be found here—we consider both regular season and postseason performance in our selection of awards. Though the input of Ultiworld reporters is weighed heavily, final decisions for awards are made by the editors. To see the D-I Women’s 2018 Player of the Year Award, go here. Few players were more enjoyable to watch on offense than Ashley Powell. NC State’s star handler wasn’t the most explosive or daring thrower in the women’s division, but she rarely ever took a bad shot. The precision and calculation involved in Powell’s offensive style at times verged on transcendent. It’s not that she could put the disc anywhere, it’s that she knew exactly where she needed to put the disc for her team to succeed. There’s a reason almost every assist from NCSU flowed through Powell. On offense, she played chess while everyone else was stuck playing checkers. If there is any reason that Ashley Powell’s rise to fame has been surprising, it’s because of NCSU’s unique regular season. By foregoing any of the larger tournaments on the West coast, NC State hardly had any games against competitors outside of their region. Clearly this was a missed opportunity for fans, as Ashley Powell put on one of the best single player performance at Nationals we’ve ever seen. An otherworldly 33 assists in 5 games was complemented by 12 blocks and 4 goals. To put that number in perspective, Ashley Powell was responsible for 6.6 assists per game. The second highest tally of average assist per game was 4.0. Ashley Powell was responsible for at least two more points per game than any of her competitors at Nationals, and that’s one of the reasons why she’s our Offense Player of the Year for 2018. Lee took on an increased offensive workload for Dartmouth in 2018, as the team reworked its system to cope with the loss of Angela Zhu. She took advantage with a massive campaign. She was uncoverable in the redzone at Nationals, scoring a division-high 24 goals, including eight in a scintillating performance in the final. Lee also added 17 assists, tying for the twelfth most in the field, showing off her full offensive repertoire. Finalists for the OPOTY often excel in one facet of the offense: high volume scoring, precise hucks, etc. But Lee earned her spot this year with a well-rounded offensive game that was pivotal in her team winning their second straight National Championships. Elimelech was the driving force behind a UCSD team that took the division by storm. Before the season began, there were very few expectations for the young San Diegan squad. When the regular season finished, UCSD had the third best record in the nation, largely due to Elimelech’s monstrous two-way performance. She played every position for the Psychos and was just as likely to launch flick hucks as she was to score in the endzone. While she was instrumental on defense for UCSD, it was really her offense that offered the most to the team. Elimelech is a walking mismatch against most defenders and could get open with ease. The Psychos season may not have ended as they would have hoped, but it certainly put Elimelech on the map. Butterfield was cramping intensely in the hours leading into their semifinal game against Dartmouth — like, curled-in-the-fetal-position level cramping. To hear Stanford coach Robin Davis tell the story, Butterfield was asked about her pain level. Butterfield said it didn’t matter; she was going to play. She’d rally to earn two blocks, two assists, and two goals in that semifinal alone. Butterfield showed the same grit and lights-out playmaking style all year, making her the clear Defensive Player of the Year. The grad student may as well install her own trophy case in Ultiworld headquarters. She’s been the 2015 BPOTY runner-up, the 2017 OPOTY runner-up, and selected to the 2017 All-American second team. This season, she was the best defensive force in the division. No other player in the division has earned awards in more than two categories, but Butterfield is the obvious choice to be the first to do so. Butterfield played her final year of eligibility with Stanford Superfly, where she stepped up as a badly-needed deep force in their 2018 game. Butterfield was a great player at Notre Dame, and she somehow got even better in Superfly’s system.1 From her legendary Northwest Challenge duel with Jaclyn Verzuh to tough games on UNC’s Jenny Wei or Oregon’s Hayley Wahlroos, Butterfield stayed within an arm’s length of the division’s best players. If teams took a chance, Butterfield was always ready to make the impossible block in the air or by hitting the turf. She was even more lethal after she generated turns. Butterfield just never seemed to tire on the field. At Nationals, Butterfield collected 10 goals and 13 assists on top of her 14 blocks, and she played more points than she rested. Butterfield’s reign over the division’s deep space this season made her a force no matter who had the disc. Perhaps better known for her aggressiveness with the disc in her hand, Sutherland matches that aggressiveness on the defensive side as well. Sutherland boasts a natural, well-rounded defensive skill set. She’s a menace downfield, where she racks up blocks, as well as an elite handler guard, where she gives backfields fits both when they’re trying to get the disc as well as when they’re trying to throw it. Sutherland’s defensive tenacity is a defining characteristic of her play and helped set the tone for her Texas team all season long. Field awareness may be the most overlooked defensive metric, and it was also one of Harris’ most impressive talents. Harris has an innate ability to understand how much separation she can allow between herself and her mark at any given point, and punished offenses when they test her on this. Her reflexes and deep understanding of the game complemented her other abilities, to the point where it seemed as if Harris was precognizant at times. But beyond her obvious innate defensive capabilities, it was her ability to take any matchup on the field that made Harris so deadly as a defender. She showed the agility to take on wily handlers and the height to contest any dominant cutter downfield. Barring one or two notable competitors, there was no player in the women’s division that gave Harris trouble when she’s marking them. It’s pretty amusing that the Breakout Player of the Year came armed with the division’s breakout throw, the off-hand backhand, while playing for the breakout team of the season. But if you ask defenses tasked with defending her, that probably didn’t put smiles on their face. Iwamoto sliced and diced her way through defenses for all of 2018, abusing marks with the quick break throw befitting of her style and her team’s offensive structure. The first time? Cute throw. The eight time? Please stop. While that specific throw highlights Iwamoto’s season, her effectiveness came from much more. The UC San Diego handler played with intense pace, rapidly dealing fakes and whisking away defenders with sharp jabs and cuts. There simply was no respite for defenders tasked with tailing her under her blistering assault of break throws and upline cuts. Her ability to maintain a constant momentum only further put defenders on the back foot, allowing her to open up the field for her teammates. Iwamoto’s nine points (four goals, five assists) across five games at Nationals doesn’t blow you away, but watching her play did. She was the engine behind UCSD’s balanced attack that produced eight players with 8 or more points on the board in Milwaukee. At points, she was the most vital and productive component of the best season in UCSD’s recent history. Harrison transferred to Texas from TCU before the spring semester and immediately became one of the team’s primary focal points on offense. Using her elite speed to beat defenders at every level of the field, and her massive layouts to make highlight reel catches, Harrison was both dependable and electric for Texas on their run to quarterfinals this year. With Marissa Land and Laura Gerencser both leaving the program next year, look for Harrison to be an even more vital part of the team’s offense in the future. Mizener was a true breakout player who stood out this season on North Carolina’s already-deep roster. The second year began on North Carolina Pleiades last season as a true rookie, and this year she came into her own in the team’s cutting lanes. Mizener is fast and can change direction on a dime to find the deep lanes. She had nine goals, 12 assists, and six blocks during Nationals, tying Ohio State’s Cara Sieber to lead women’s division sophomores in assists. Beyond Jenny Wei, the team’s star and a POTY runner-up, Mizener had the highest +/- on the team (+17) as well. Count on seeing more of this speedy sophomore next season. Trop has been a lock for this award from the beginning of the season, and she’s only exceeded expectations since then. It’s almost unfair how easily she fit in with the Dartmouth team. It was apparent very early on that she was comfortable playing both offense and defense with her teammates and could take control of a game if necessary. No matter the game she’s playing, Trop played with an assurance and composure of a player far beyond her years. Nothing seemed to phase the true Freshman and she easily mitigated the loss of Angela Zhu for Dartmouth. Even before Nationals, Trop was clearly one of the best players in the nation, competing at a level that exceeded seniors and fellow rookies alike. But then Nationals happened, and there she made a case as maybe the best player at the tournament. Trop recorded an effective +/- of 44 and an average +/- of 6.29 per game. That’s the highest of any player at Nationals. Period. And it holds true despite her playing three more games than most of her competition. Only one other player, Jenny Wei, even comes close to that sort of efficiency. Trop’s complete set of skills meant she could destroy her opponents in a multitude of ways, and she did. It’s hard to recall another rookie having this type of impact, except we saw it happen two years ago when Verzuh tore through her competition at Nationals. That’s not to say Trop is the second coming of Verzuh. Frankly, with her embarrassment of talent, Trop has the potential to match even her teammate’s prodigious impact on the division. Many of the division’s top rookies were known commodities, U20 National representatives and youth stars. But by season’s end, she was drawing the same “She’s a freshman? !” exclamations as her more heralded counterparts. Kowosky was second among freshman at Nationals in assists with nine tallies, while placing third on Pittsburgh in that category and fourth in +/- for her semifinalist club. She developed a great deal throughout the season, building poise and confidence to go with throwing skill and game IQ that made her a mainstay in Pitt’s O-line backfield. Even casual ultimate spectators noticed Arevalo playing for Carleton this season. They’d glance over at Syzygy’s game and their eyes would start following Arevalo’s devastating footwork or her big hucks. 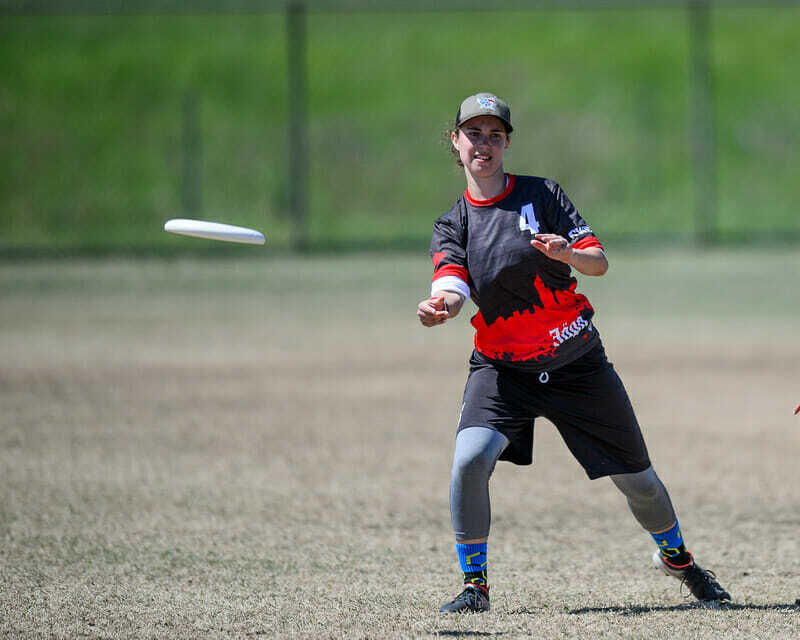 Arevalo hails from the Paideia ultimate program as well as the 2016 U20 National Team, and she played like a staple of Carleton’s offense because she already is: Arevalo started on the O-line for most of Nationals, and she tallied five goals, seven assists, and five blocks. Arevalo played steady, veteran ultimate, and Carleton gets to enjoy her game for many years to come. Since joining the North Carolina coaching staff in 2014, Jessi Jones has been positively impacting the proud Pleaides program. She entered the picture while the club was in the midst of a drought of Nationals appearances, despite consistent national relevance. Along with a strong staff, good recruiting, and quality leadership, Jones shepherded UNC back to the College Championships and this year, prominence while there. It wasn’t hard to see the influence of coaching written all over the play of the younger players on UNC. 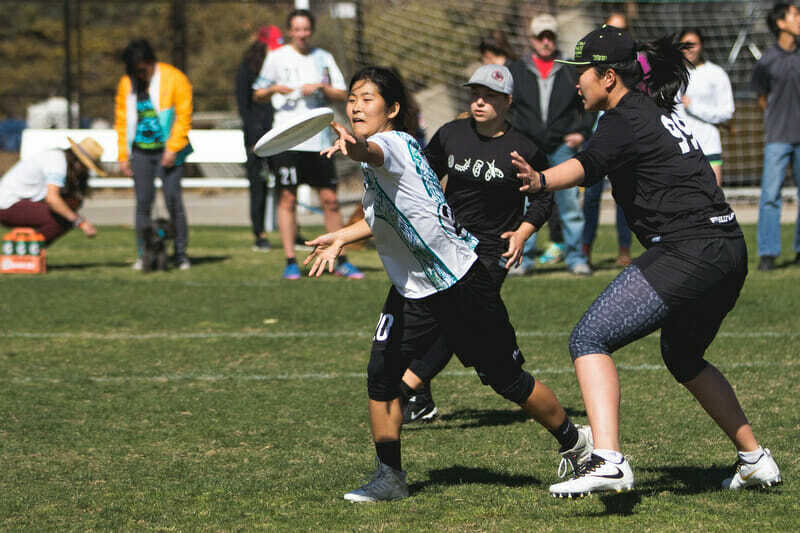 While the duo of Jenny Wei and Elisabeth Parker had earned some notoriety, the team’s deep roster of playmakers burst onto the scene in the Pleaides’ system this year. The team had a focused gameplan built around transitioning quickly from defense to offense, an effective playbook, and the ability to execute those strategies with discipline and attention to detail. Those elements are hallmarks of great coaching. While a 2018 run to the quarterfinals might feel like a culmination after years of missing out on Nationals, the flush recruiting pipeline and fast-developing young talent on Pleiades’ roster says that this is a stepping stone to greater heights. With a guide like Jones there to steward that growth, the future is shining very bright in Chapel Hill. After Stanford lost to Oregon at the Stanford Invite, the Superfly coaches sketched up the Oregon zone that was giving them so much trouble. They wanted to learn it so they could eventually beat it. Instead, they threw it at Dartmouth during a semifinal battle at the Northwest Challenge that Stanford nearly won. Then they practiced the zone, and used it throughout Nationals to reach a semifinal rematch with Dartmouth. That’s insane. There’s no other way to put it. Stanford has long had an arsenal of crafty defenses to throw at teams, most of which come from the ultimate braintrust that is Davis’ mind. Their defensive flexibility and offensive discipline are big parts of why this Stanford’s coaching core were COTY runners up in 2016, the last time Stanford Superfly won the title. From methodical scouting to defensive creativity (and plagiarism, it seems), Davis and assistants Jamie Nuwer and Jennie Lummis got the best games out of their roster in every game this season. Pittsburgh’s rise to prominence may have begun prior to Banyas’s arrival, but he helped guide the team to new heights since joining the program in 2016. In their fourth successive trip this year, they went on their best ever run, making it all the way to double game point of semifinals. Banyas has created a true program at Pitt, and instilled a team culture that has fostered remarkable individual and team development over the years. Pittsburgh has had some impressive high school talent into the program, to be sure, but under Banyas’ stewardship every player has shown progress this season, and in his own words had their best tournament of the year at Nationals. Banyas has simply developed one of the best team cultures in country, and that paid huge dividends in the team’s performance this year. 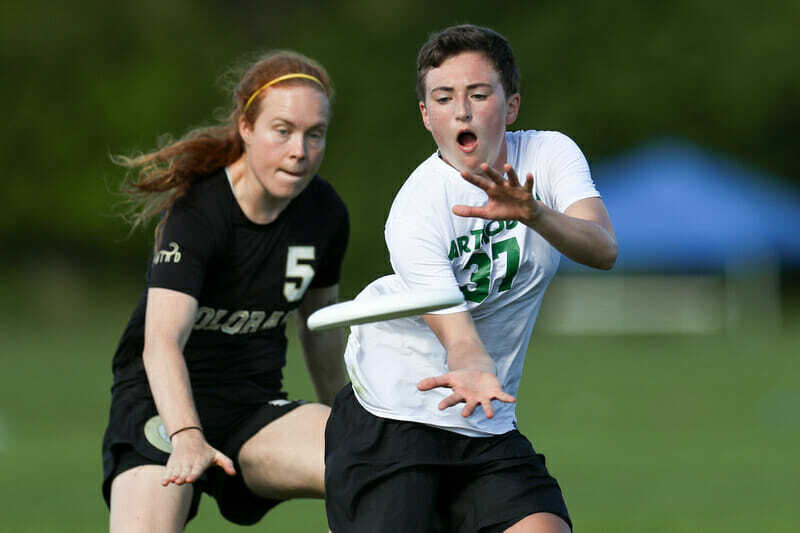 Katie Raynolds took a break from Seattle ultimate to test out the Midwestern scene, but now she's back in the Northwest to investigate this "bubble" she keeps hearing about. She played for Northwestern Gungho, two seasons with Chicago Nemesis, and now plays for Seattle Underground. 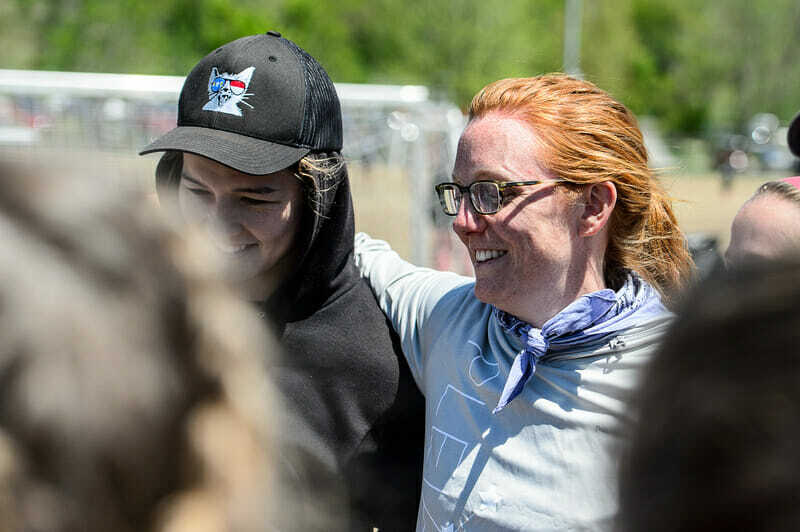 Katie serves as Ultiworld's Women's D1 College Editor, and is damn proud to cover women's ultimate. You can reach her by email (katie@ultiworld.com) or on Twitter (@kraynolds90). Comments on "D-I Women’s 2018 College Awards, Presented by VC Ultimate & NUTC"